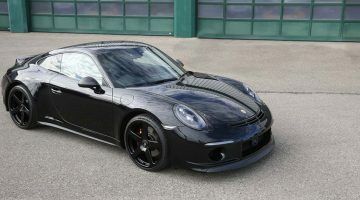 New Porsche 911 GT3. DRIVEN. Revolution? crankandpiston heads to Germany to test the all-new Porsche 911 GT3. Is it a revolution or an evolution over the predecessor? We cannot display this galleryYou may be sceptical, but Porsche’s launch of the new 911 GT3 is probably the most hotly anticipated of the year. When you consider the other contenders to have made an appearance already this year – the new Cayman, Jaguar’s F-Type, BMW’s new 4 Series Coupe, and Volkswagen’s Golf GTI among others – that’s quite a claim. But let’s not forget that Porsche’s headline lightweight sportscar has been with us for 14 years, has amassed a formidable reputation both on-track and off, and spawned probably the most recognised single make motor racing series across the globe. Any changes good or bad on the new generation – particularly during the 911’s 50th anniversary – were always going to be under the spotlight. None more so than the seven-speed PDK automatic transmission complete with paddle shifters that replaces the GT3’s traditional manual gearbox. 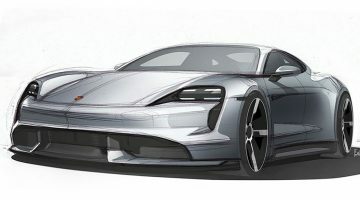 Purists were in uproar at the announcement, though this did serve to highlight a significant point: was the automotive world about to see an evolution of the GT3, or an epoch-making revolution? As a former owner of a 911 GT3, I was also keen to discover which. Though Porsche has (of course) stayed true to the 911 DNA, the new 991 gen GT3 is a stunning piece of kit. At the front the classic round headlines remain, though a lower front spoiler and longer bonnet make for a sleeker, more aggressive look than the retiring 997 iteration. A much wider rear track –wider than any previous GT3 generation at 1555mm – helps emphasise this sportier look as does the redesigned rear wing. But it’s the 20-inch wheels that really make an impression in profile: clad in Michelin’s grippy Sport Cup 2 tyres developed specifically for the GT3, these forged alloys look enormous against the angular body, but actually weigh the same as those on the old model. And, naturally, look the absolute business. Step inside and the sportiness of the exterior is temporarily replaced by lashings of Alcantara about the rooflining and upholstery. It’s back to track basics with the bucket Porsche Sports Seats Plus, which prove a snug fit but raised side supports improve lumbar support. There’s the traditional Porsche infotainment system, uncluttered centre console and beautifully stitched seams: there’s also the no extra cost optional Club Sport Package, that offers carbon seats, a roll cage and fire extinguisher for those heading regularly to the track. But it’s a cabin boasting little thrills. And that’s good. It matches the character of the car perfectly. There isn’t a myriad of unnecessary settings and systems to play with, the suspension settings, PDK drive mode selection and Sports Exhaust buttons (all important for that irresistible 911 burble) the obvious exceptions. It encourages you only to turn the starter switch. Doing so unleashes a ferocious roar from the naturally aspirated 3.8-litre flat-six, a replacement to the larger Metzger unit that now incorporates direct petrol injection and lighter cylinder heads for staggeringly high revs: top performance creeps in at 8250rpm and the needle doesn’t stop until it hits 9000rpm. Put together, that equates to 468bhp, 325lb ft of torque, a top speed of 315kph and a 0-100kph time of 3.5seconds. Driven in anger, the new GT3 nails 7m 25s around the Nordschleife: that’s a full 15 seconds faster than the outgoing model and 2s faster than the marque’s outstanding GT3 RS 4.0. Surprisingly, in normal cruising mode, the civility of this proven track weapon throws me completely. The 3799cc unit is quiet at low revs, gearshifts are very smooth with no jostling and normal suspension and damping settings prove comfortable. Even the pneumatic lift system– that raises the front axle by 30mm to avoid scraping the nose on road humps – is a carry-on from the old generation model. 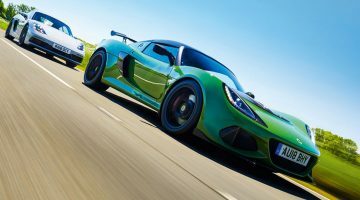 This has me worried: despite its ferocious Nurburgring pace, is this ‘revolutionary’ model actually a softer, less ‘grab it by the scruff of the neck’ sportscar than its predecessor? This thought process lasts until I press the Sport Exhaust button, slip the gearbox into manual, and floor it. Suddenly the GT3 throws off its camouflage and the engine screams as if to say ‘how dare you call me soft’. The flat-six noise is phenomenal in itself working with the exhaust in its full bore and between 8000-9000rpm the sound ricocheting about the cabin hits a level I have not heard outside a Formula 1 circuit. Porsche’s decision to (finally) modify the gearchange selector – so that down is now an upshift and up is a downshift in keeping with a traditional sequential gearbox – means crisp gear changes can be utilised to their fullest. Indeed, hit the Sport PDK button, and as well as remapping the 468bhp engine for faster throttle response, shift times are reduced to 100 milliseconds, offering no lag right up to the 9000rpm limit. Power is constant, momentum endless and the thrill absolutely joyful.